Well, I certainly didn't see this coming. If someone had told me three years ago that we would still be waiting for our daughter, I would have been shocked. But if someone had told me that we would be impacted by swine flu? Well...I can't say that I would have believed them. But here we are. No referrals were mailed this month (the last set of referrals went through 3-8-06 and were sent at the beginning of April), and every agency has a different explanation. 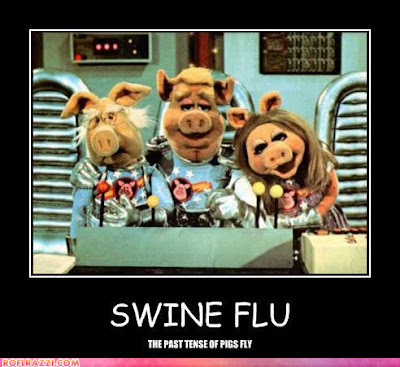 Some agencies are just saying that they are late this month, and that the swine flu won't impact anything. Other agencies are saying that the CCAA has told them that they will be holding referrals for 20-30 days. Still others are saying that the CCAA is holding things until June. And yet another sent out an email yesterday saying that no referrals will be sent until September. Yes, you read that right. So where does that leave us? Well, aside from the stress of not knowing anything (and the ridiculousness of the worldwide reaction to the sniffles), I am hoping that we won't really be impacted. The precedence that the CCAA has set from the SARS scare is promising. During that time, all referrals stopped, but the CCAA continued to make matches. Once all of the travel restrictions were lifted, they sent out huge batches of referrals (and more than one batch a month) to "catch up." We weren't going to get a referral this month anyways, so if they send out a larger batch next month, we would be in the same place. But I don't know. The not knowing is horrible, and the number of agencies that say that they have talked to someone at CCAA and have wildly different information is absurd. As Chris often says, we are adopting from a country that doesn't give out information, but this stinks. As for the two of us, we are laughing in the face of swine flu, and flying to Mexico for our vacation on Monday. Really. Even after United cancelled our flights (would you believe that United has canceled nearly every flight to Mexico until JULY?? ), we have rebooked and are planning on spending a blissful few days on the beach in Cancun. No internet (so no monitoring the referral situation) will be a good thing. And hopefully we will come home to some good news.